The Bellator Welterweight Grand Prix matchups have finally been announced by the promotion with the first fight in the tournament taking place on Sept. 29. Each of the fights taking place in the Grand Prix tournament will be contested for five rounds with champion Rory MacDonald putting his belt up for grabs in each tournament fight. The last man standing at the end of the Grand Prix will be declared the Bellator welterweight champion. The matchups in the opening round include MacDonald facing former UFC title contender Jon Fitch as well as top prospects Neiman Gracie and Ed Ruth squaring off on the same side of the bracket. The winners of the fights between MacDonald vs. Fitch and Gracie vs. Ruth will then meet in the semifinals. On the other side of the bracket, former champions Douglas Lima and Andrey Koreshkov will meet in a trilogy after their first two fights were split between them. They will meet in the first fight of the Grand Prix taking place on Sept. 29 with the entire tournament airing live on DAZN. The final matchup will see bitter rivals Paul Daley and Michael ‘Venom’ Page face off with the winner then taking on Lima or Koreshkov. There will also be one alternate bout pitting Lorenz Larkin against Yaroslav Amosov as well. 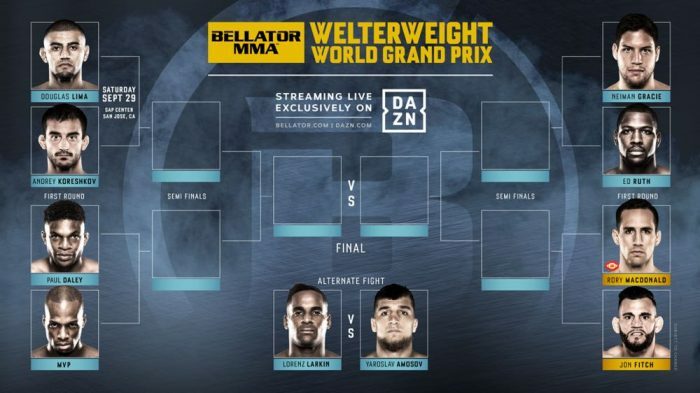 The entire Bellator Welterweight Grand Prix will stream live on DAZN, the new streaming partner of Bellator MMA with the service launching in September at $9.99 per month.